Scheduled adjustments and repairs will keep your lawn looking lush and healthy. To keep your system running efficiently, we strongly suggest that you schedule a mid-season check-up. Broken sprinkler heads or uneven water pressure can lead to unsightly brown spots. Over watering or puddling caused by improperly working sprinkler heads can cause a fungus to form on your lawn. When a Hi-Tech Irrigation service technician comes to your home, he will assess your lawn to see if any areas are being under or over-watered. They will inspect each station for proper functionality and make any necessary modifications to your watering schedule or sprinkler head rotation to get your system working at its peak performance. A quick fix is usually all that is needed to fine-tune your irrigation system and get your lawn looking beautiful again. Broken sprinkler heads are a common issue caused by lawn mowers, construction workers and backyard toys. Our technicians are available for sprinkler repairs Monday through Saturday. Simply call our office and speak to a customer service representative to schedule an appointment. Our courteous and knowledgeable staff is happy to answer any questions or concerns you may have. 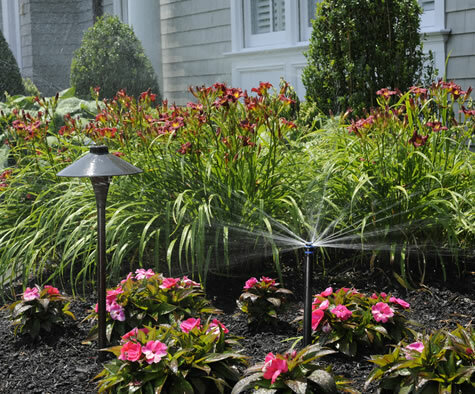 Contact the sprinkler system experts at Hi-Tech Irrigation today to schedule your Long Island residential or commercial sprinkler system mid-season check-up or repair.